Emerald is a green variety of Beryl. The color is caused by Chrome or Vanadium. Depending on the color and clarity the price could range from a few dollars to many thousands per carat. Emeralds are found in every continent and the most prized ones are from Colombia. Usually flaws decrease the price of the stones, not unlike most gems. One exception is the trapiche. 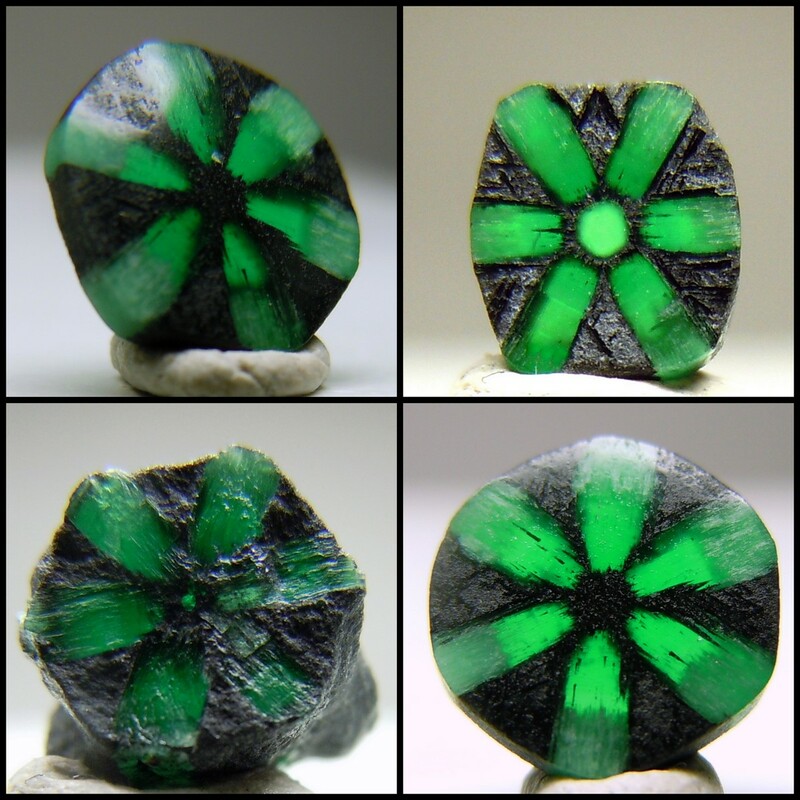 Trapiches are a rare kind of Emerald with the presence of black carbon impurities giving the Emerald a radial six pointed star pattern. It is usually made into oval and round cabochons but I have seen different shapes too. More recently, Colombia has produced some different trapiches. They look more like flowers. The carbon is thicker with sharper definition. It looks best when sliced, like the watermelon Tourmalines. Sometimes the center is black but it can also have a green center. Each piece is unique and the contrast of green and black is quite beautiful. I don't understand why no one--and I mean absolutely no one--hasn't commented on the aesthetic beauty of this rock. The lines are a perfection of nature and the colors look simply delicious. Nice choice. Bold and clear strokes of natures colour,great choice. You may look towards my country India for greater variety of gem rough,specimens and faceted.